This interesting name is of early medieval English origin, and a locational surname deriving from a place called Hardcastle Cross in West Yorkshire, near Hebden Bridge. The placename means "the impregnable fortress", derived from the Middle English "hard", difficult, impregnable, inaccessible, sometimes "cheerless", with "castel", castle, fortress, or stronghold. Locational surnames were acquired by the lord of the manor, and local landowners, and especially by those former inhabitants of a place who had moved to another area, usually in search of work, and were thereafter best identified by the name of their birthplace. Yorkshire Church Registers record the christening of Marmaduke, son of William Hardcastle, at Pateley Bridge, on February 3rd 1555, and the marriage of Barthalomue Hardcastle and Janet Ellis on September 21st 1596, in Leeds. One Mathew Hardcastell was listed in a "Muster of the Inhabitants in Virginia" taken in 1624; he arrived in the same year on the "Jacob". 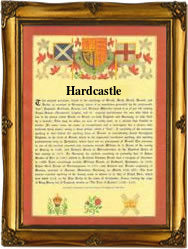 A Coat of Arms granted to the Hardcastle family depicts, on a black shield, three red leopards' faces on a chevron between three castles, silver. The Crest is a lady attired in blue, holding in the dexter hand the sun, and in the sinister the moon proper. The first recorded spelling of the family name is shown to be that of Ann Hardcastle, which was dated October 8th 1551, christened at Pateley Bridge, Yorkshire, during the reign of King Edward V1, known as "The Boy King", 1547 - 1553. Surnames became necessary when governments introduced personal taxation. In England this was known as Poll Tax. Throughout the centuries, surnames in every country have continued to "develop" often leading to astonishing variants of the original spelling.